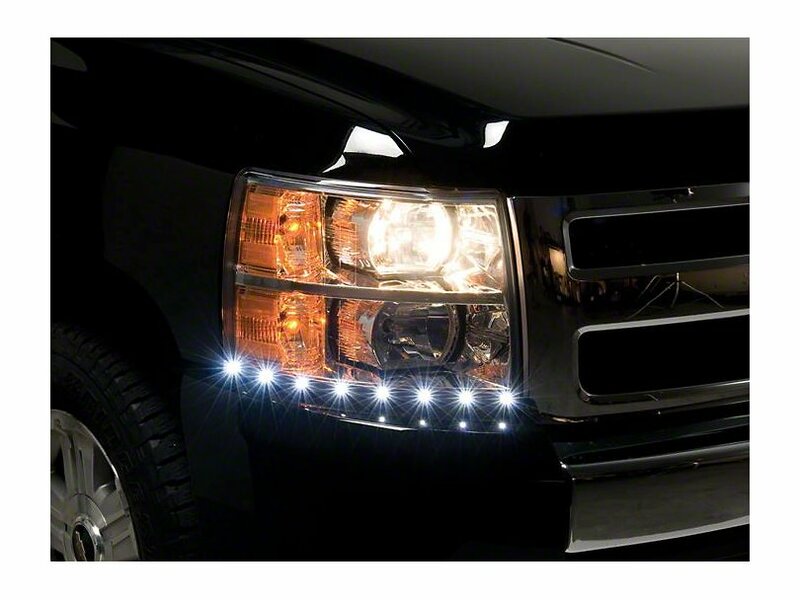 Lights are a great way to improve your Silverado's versatility both at a job site and on the road. From LED to HID, chrome or smoked the perfect set of headlights will help complete your trucks build. Accenting your Silverado 1500 with a brand new headlight kit could increase your visibility while driving and also provide your Silverado 1500 with a modern, cosmopolitan look. Choose from bright LED and HID conversion kits that are guaranteed to last longer than factory stock halogen projector bulbs. For added visibility and a customized look, add on a pair of LED Dayliner strips or a pair of corona LED rings for increased visibility and less eyestrain while driving. While most Silverado owners wouldn't think of their headlight cluster as a necessary upgrade, they can save you a lot of headache from constantly having to replace burnt out low beam halogen bulbs. Your Silverado’s stock headlight panel is a four-piece design, featuring a low-beam, high beam, turn signal, and fog light. Newer Silverado 1500 models (2016 to 2018) feature factory fresh LED bulbs that yield far more luminosity than its predecessors. Of course, your stock LED bulbs can still be improved with an HID conversion kit, LED Dayliner strip, or halo ring add-ons for even more visibility while driving. For older generation Silverados (2007 to 2015), GM unfortunately didn't make any improvements to their factory headlight setup. 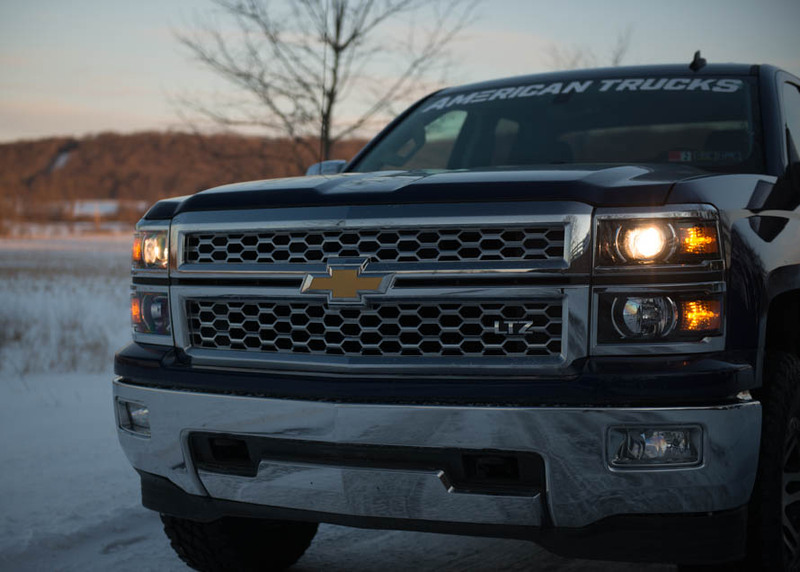 Silverado low beams use a H11LL bulb, 9005LL bulbs for high beams, and 5202 bulbs for fog lights. 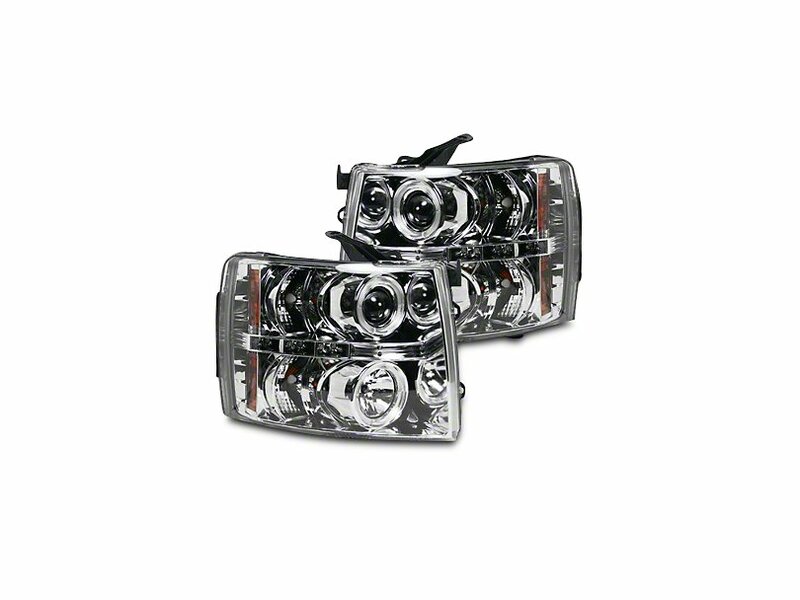 The H11 low beam kit for these Silverado models represents the lowest quality and cheapest kit available. While that's not necessarily a bad thing, most Silverado owners will not receive the luminosity and brightness they need out of their headlights. There are plenty of HID and LED H11 kits available to upgrade existing stock bulbs, or even complete LED and HID conversions that offer far more capabilities and durability than the H11 bulb series. While your Silverado's high beam and low beam halogens will get the job done, they’re rather plain looking and they can only produce up to 1200 lumens on average. At AmericanTrucks we offer aftermarket lighting kits reaching beyond 2500 lumens as well LED truck headlights that run for over 50,000 hours. Here we're going to discuss some aftermarket upgrades to your Silverado’s headlights that can give it a stylish, sophisticated look and greater visibility while driving. LED: Light emitting diodes are small semiconductors that emit light when a small electrical current pass through. With an ultra-low operating temperature, LED headlights can run well over 50,000 hours. They are also considered some of the brightest headlights on the road, especially during the day. Most LED kits will feature a daytime running light that wastes less energy than any other bulb on the market. HID: High-intensity diodes are like standard halogen bulbs, but they scrap the heating filament completely. Instead, HID lights operate using gas allowing them to operate on a low temperature. HID lights last longer than halogen bulbs, but not as long as LED lights. Some HID kits are also brighter than LED lights and performance halogen lights. LED lights are much cheaper than HID lights and much easier to install. For most Silverado models, an HID conversion kit will require a ballast and multiple power relays to operate. If you have the money, you should consider purchasing adaptive headlights. Adaptive headlights will illuminate corners and turns that you steer toward. There are ultra-bright LED adaptive lights which are becoming standard on many luxury sedans. Higher kelvin lights mean bluer light, not brighter. Higher light output results in whiter light, not brighter light. One way to get even more luminosity out of your headlights is by installing halo rings on your existing halogen bulbs. Halo rings or corona rings are LED powered, ultra-bright rings found in many aftermarket conversion kits and headlight upgrades. They essentially intensify the light being emitted by your headlights and make them appear brighter. Choose from CCFL halo rings or LED halo rings. Both are inexpensive and offer their own benefits. CCFL halo headlights are not as bright as LEDs during the day, but offer greater visibility during the night. Most LED halo rings are bright enough to operate as a low-energy, daytime running light. Choose from sleek, chrome headlights powered with plasma based halo rings. These rings essentially operate as a single, bright LED bulb and can be customized with color changing diodes to give your Silverado a dazzling and ultra-modern look. 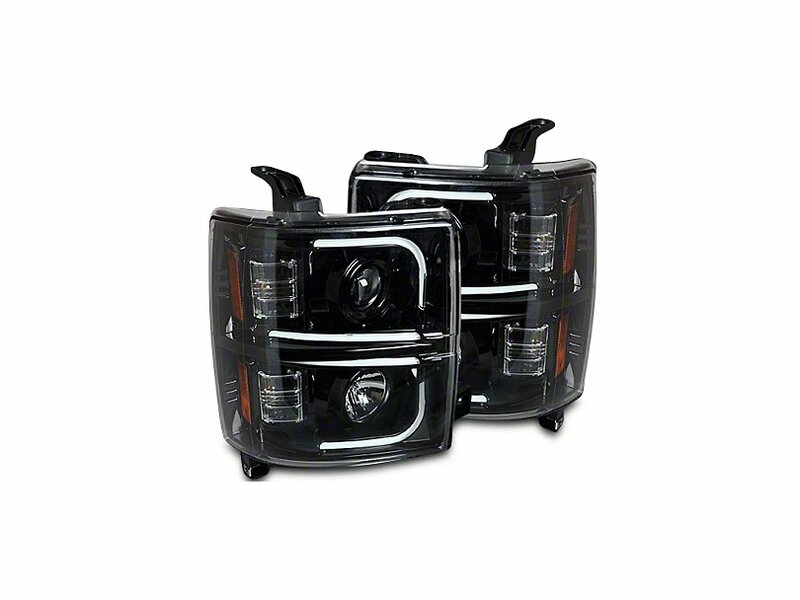 Silverado owners can also choose from utilitarian chrome headlights with amber lenses. If you’re looking for a headlight to complement your factory finish than a chrome headlight panel is the perfect fit. Clusters are available in two-piece or four-piece sets and with different options for LED or CCFL corona rings. 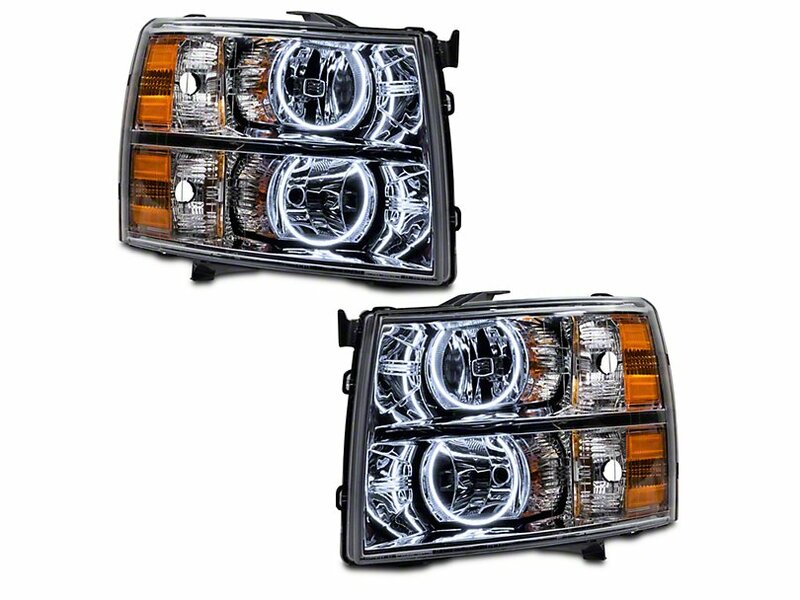 For that true bellicose Silverado style, consider a pair of smoky black headlight clusters. For older Silverado models, choose from clear lensed black headlight clusters with ultra-bright halo rings. For newer generation Silverados, you can accent that boxy, bold look with a blackout headlight cluster. Choose from two-piece and four-piece panels featuring long-lasting LED bulbs. All headlights feature easy plug and play installation so upgrading your Silverado takes minutes. Finally, a brand new LED Dayliner strip could add even more brightness on top of your corona ringed LED lights. LED Dayliners feature color changing diodes and offer a truly unique headlight display. With easy installation, LED Dayliners are guaranteed to remain in their spot and not interfere with your existing headlight cluster. Replacing your Silverado’s driver side headlights only takes a few minutes. Simply pop the hood and reach behind the housing unit. To replace any existing truck lights, you’ll need to give them a quarter turn counter clockwise and press the release button on your power connector. Be sure not to touch the wires so you don’t short or overheat the bulb after installation. To replace passenger side headlights, you’ll need to remove the passenger side airbox to reach the housing unit. You’ll need a torx head screwdriver to remove the screws. To replace turn signals, GM has placed a cutout where you can reach into and remove by hand.